Built in Cooker Hoods. Juicers and Smoothie Makers. Massage and Well Being. Air Conditioners &map; Purifiers. Hot Plates &map; Warmers. Tea Makers &map; Hot Water Dispensers. Health Grills &map; Sandwich Makers. Mini Ovens &map; Hobs. Slow Cookers &map; Multi Cookers. Handheld & Cordless Cleaners. Wet and Dry Cleaners. TV, DVD & Blu-Ray. Soundbars & Speaker Kits. 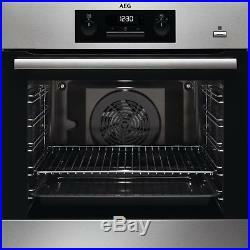 AEG BPK351021M SteamBake Built in Pyrolytic Single Fan Oven in Stainless Steel. Main Oven Capacity: 72. Add steam for crispier baking – In addition to all your standard oven functions, the PlusSteam button in this SteamBake oven adds steam at the beginning of the baking process. The steam cooking keeps the dough moist on the surface to create a golden color and tasty crust. A self-cleaning oven – With one touch of the Pyrolytic cleaning function, dirt, grease and food residue in the oven is converted into ash that you can easily wipe off with a damp cloth. Cooked evenly everywhere – With this oven, using energy efficiently also means cooking efficiently. It has a new convection system called Hot Air, which ensures hot air circulates evenly throughout the oven cavity. More Benefits : Hexagon timer display gives you even tighter control over the precise cooking of your dishes, Multilevel Cooking, cook dishes evenly with this oven thanks to an additional heating ring element, Safe to Touch Top keeps the door cool and safe to touch. Main Oven Capacity (litres). How will I receive my order? Small items are sent securely by our courier DPD and will require a signature upon arrival. If you need to change the date or time you can respond to the text message to re-arrange. Calls to an 03 number will be charged at local rate and will cost no more than a call to an 01 or 02 number, irrespective of whether you call from a landline or mobile. If you have’inclusive minutes’ with your package these calls are included, however, please check the costs of calls with your provider before dialling. For security and training purposes, telephone calls may be recorded and monitored. The product has not been used. The product is in its original packaging and the seal is in tact. It is in a resalable condition. In the case of goods where data or software can be loaded (eg laptops or digital cameras etc), the product must not have had any software installed or data inputted. Quoting your order number. The Co-operative Retail Services. PO Box 730, Broadway, Barnsley, S70 9LW. Please do not forward correspondence to this address. We will charge you the cost of replacing any missing item(s). If the product develops more than three technical faults in the first year of the guarantee period an identical or comparable replacement will be offered if requested. In the event that the goods have already been despatched at the date of receipt of your cancellation of the order you must return the goods to us and we will credit your credit or debit card with the price of the goods within 30 days beginning with the day on which notice of cancellation was given. If you do not return the goods within 21 days of your cancellation, we will make a charge in respect of the cost of recovering the goods. This does not affect your statutory rights. We recommend that you obtain proof of posting. Your statutory rights are not affected. There is a charge for collection, which is as follows. Please note: – The following address is for letters only. The Co-operatives E-store Ltd, 12th Floor, 1 Angel Square, Manchester. PLEASE DO NOT attempt to return products to The Co-operatives E-store Ltd address, there are no facilities to accept parcels or packages at this office. Co-operative Electrical is a trading name of Co-operatives E-Store Limited which owned and operated by the Co-operative Group. The Co-operative Group is the UK’s largest mutual business, owned not by private shareholders but by almost six million consumers. It is the UK’s fifth biggest food retailer, the leading convenience store operator and among its other businesses is the number one funeral services provider. Our product range has been developed by including only renowned manufacturers offering quality products. We only include market leaders within our product range to ensure our customers are purchasing a product that will be reliable and provide excellent service. We have a main range of electrical products that are brand new, boxed and come with a full manufacturers guarantee. We pride ourselves on our commitment to delivering the highest standard of customer service to all our customers. The item “AEG BPK351021M SteamBake Built in Pyrolytic Single Fan Oven in Stainless Steel” is in sale since Thursday, October 25, 2018. This item is in the category “Home, Furniture & DIY\Appliances\Cookers, Ovens & Hobs\Ovens”. The seller is “co-operativeelectrical” and is located in United Kingdom. This item can be shipped to United Kingdom.